Malta Cage Birds Association - M.C.B.A. - bird pet club - canaries - finches - parrots etc. Members meet in a friendly atmosphere and have a cup of coffee while making use of our growing library which also includes videos, and have a photocopiers at their disposal. Members of the public making queries by phone to the 'Centre', will receive expert advice from experienced breeders. To encourage and promote the breeding and well being of cage and aviary birds. The Malta Cage birds Association is just five years from its inception, managed to acquire about 450 members. It embraces five sections; Parrot-like, Finches, Type Canaries, Coloured Canaries and a Gozo Section, with each section having its own comitee directing its members under the guidance of a central comitee. The latter, managing the whole organisation. All comitee members of the Malta Cage Birds Association, are elected at the 'Annual General Meeting', from amongst the association members. We encourage discussions and being a member of such an association, gives the members the opportunity to meet and discuss problems faced by the fancier, which in most cases, unfortunately, has no right or wrong answers, with other members of the association. Exchanging of information on techniques and bird room management is of utmost importance for the well being of these creatures. To better enhance communication between our members, we managed to acquire an adequate premises, in the central part of the island, at Imriehel, called the 'MCBA Centre' This was an old technical school, and has been converted to high standards and specifications to give friendly atmosphere to our members and to reach our objective. At the premise's large and spacious hall, we organise lectures and meetings, sometimes accompanied by videos and photographs, on various aspects of aviculture by both local and foreign fanciers in the field. Another advantage for the Malta Cage Birds Association members, is the use of a growing library of books, videos, back issues of magazines etc. At our premises, members can borrow anything they require. The library is equipped with a photocopier, and the members can copy a specific article instead of borrowing a book. All members recieve the association's free quarterly publication 'L-Ghasfur' packed with interesting articles and past members experiences. The association organises table shows during the months of October and December for all of its sections. A national pet show, for all the species of birds altogether, is held in November, for which foreign judges are invited to place the awards, thus ensuring that a high standard is met. 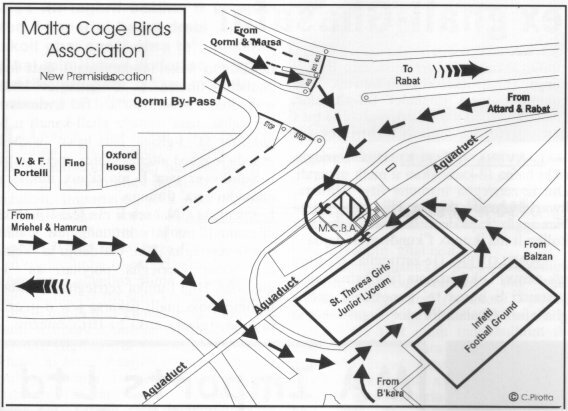 The Malta Cage Birds Association organises social events for its members and their families. Such events, besides helping the association financially, help us get to know each other more. For more information please contact the MCBA centre on tel. no. 21491830 or visit the centre during the following opening times.